These three exhibitions commemorate the centenary of World War I by telling stories about its impact on the people of the Riverina. All three shows are on display at the Botanic Gardens site till 2018, with objects and stories being changed over regularly. Image: Private Allan Bruce welcomed home to Wagga by his parents, family and friends, 26 February 1918. When war was declared in Europe on 4 August 1914, the men of Wagga Wagga answered the call to arms. From the earliest enlistees who joined the Australian Naval & Military Force expedition to German Guinea in August 1914 to the nation-defining Dardanelles campaign, and on to the bloody battlefields of the Western Front, and beyond. Through original artefacts, photographs and first-hand accounts, He Belonged to Wagga unearths the private, personal and touching stories of those who enlisted and their loved ones who waited for them at home. This exhibition presents the stories of returned servicemen, who, after the First and Second World Wars, exchanged the barbed wire of the battlefield for the boundary fences of a soldier settler's block. It is the story of two of the Wagga Wagga Land District's largest estates, Tarcutta and Wantabadgery, and the men, women and children who made their homes there. Take a journey through their trials and tribulations. Discover how the children on the post-WWI Tarcutta estate entertained themselves. Find out what happened to the the millions of rabbits which overran Wantabadgery in the 1950s! In November 1916, local newspaper the Wagga Wagga Express, published a letter written from the front by Private Walter Day. He declared that the parcels sent by the people of Wagga were worth their weight in gold, and the same could be said for Wagga's womenfolk during World War I. From the nurses who risked their lives on foreign shores, to the ladies who worked tirelessly on the home front, Australia's female population proved instrumental to the war effort. This 'war to end all wars' not only changed the lives of the men who fought, but also the lives of the women who worried, worked and waited for news of their loved. 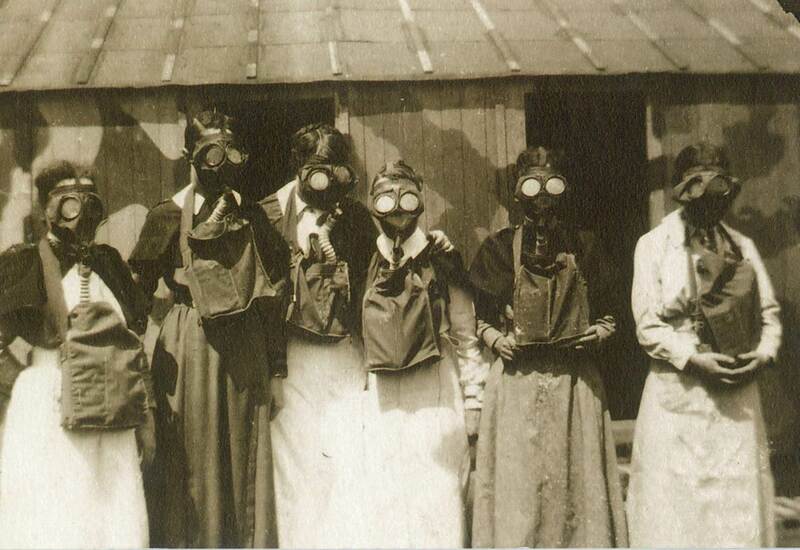 Image: Nurses, including Wagga born Annie Cameron, preparing for a gas attack on the Western Front, 1916 – 1918.